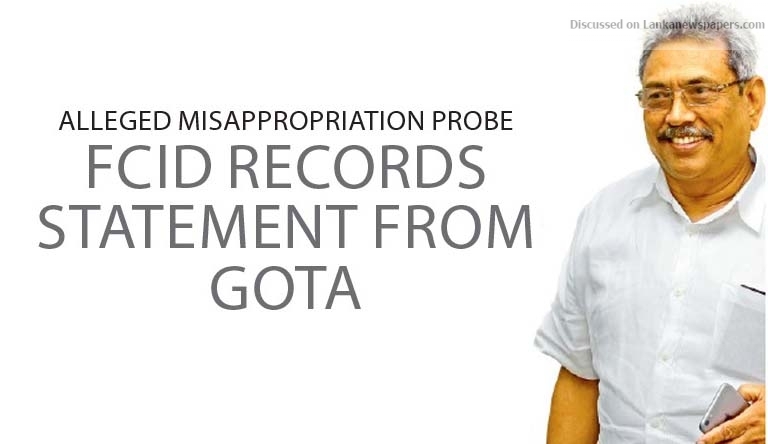 Former Defence Secretary Gotabaya Rajapaksa, yesterday (25), gave a lengthy statement to the Financial Crimes Investigation Division (FCID) of the Police, in connection with the investigation into the alleged financial misappropriation, which had taken place during the construction of the D.A. Rajapaksa Museum. Rajapaksa arrived at the FCID Headquarters in Fort yesterday morning with his lawyers and was questioned for little over three hours by the investigating officers. He was questioned over the alleged misuse of Rs 90 million in public funds for the construction of a memorial for his father, the late D.A. Rajapaksa. Gotabaya Rajapaksa, since the materialization of the accusation against him, has denied the charges. The Court of Appeal has issued a stay order preventing his arrest under the offences against Public Property Act. The stay order was issued following a writ petition filed by the former Defence Secretary.